Do a lot of texting and are sick of paying a $75+ a month for service, then Scratch Wireless is perfect for you. When you buy a Scratch smartphone, you’ll never have to pay a penny for service. Scratch Wireless was created because we love smartphones–we just don’t love paying so much to use them. With Scratch's Android smartphones, their unique technology, and Wi-Fi everywhere, it turns out smartphone service can be free. You already have the connectivity. Wi-Fi is nearly everywhere these days, and it's free. You only need cellular to fill the gaps. Their phones use Wi-Fi wherever possible—they call this Wi-Fi First. When there's no Wi-Fi around, the Sprint Nationwide Network is there to back you up so you're always connected. Texting is free, even when you’re away from Wi-Fi. Wireless providers charge you a ton of money for texting, even though it costs them almost nothing to send a text. With Scratch Wireless, texting is free and unlimited on both Wi-Fi and cellular networks. When there's no Wi-Fi around, you're still good. If you need data or voice service and there's no Wi-Fi nearby, just buy a pass. It's as easy as buying a song. For as little as $1.99, you can jump on the cellular network (provided on the Nationwide Sprint Network), do what you need to, and when you're back on Wi-Fi it's all free again. If you need more or simply don't want to think about it, we also offer bigger passes to keep you connected all the time. But there's never any contract or obligation. It's always up to you. Currently Scratch only offers one phone and that's the Motorola Photon Q for $269. If you mainly use your phone for texting and the occasional phone calls, then definitely get this phone. If you’re always by a wireless network, then get this phone since even voice calls are free if you’re on the wireless network. If you do want to use your phone outside of a WiFi area, that's when the charges come in. Scratch Wireless has a partnership with Sprint to offer $1.99 per day for up to 30 minutes of cell calls and another $1.99 per day for up to 25MB of data. There's also a monthly $14.99 pass for either 250 minutes of voice calls or 200MBs of data. CEO Alan Berrey tells us that Scratch Wireless wanted to take a different tact from traditional cell phone service. "There's no unnecessary cost with us," he says. "We have no towers, no FCC, no leasing locations to deal with." Because of this so-called "WiFi First" strategy, the phones will work internationally as well, as long as you have access to a WiFi network of course. 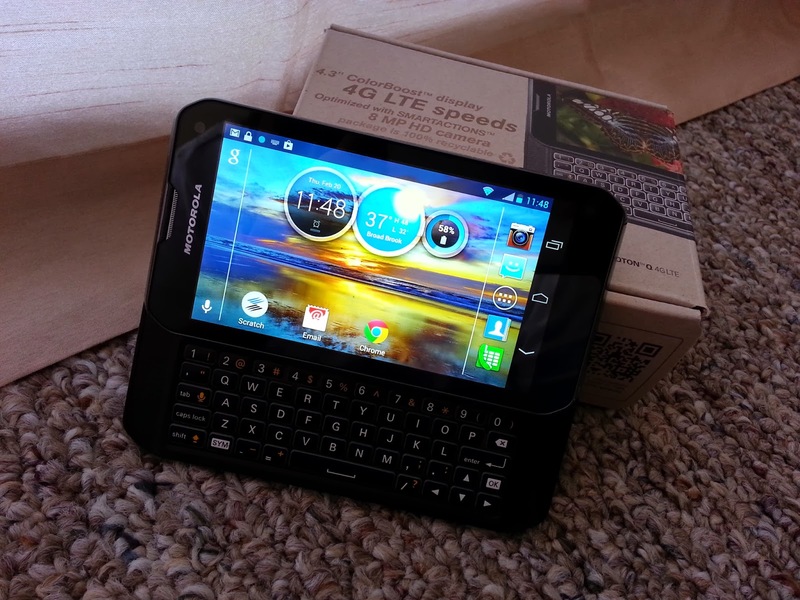 With that being said, One lucky person will WIN a Motorola Photon Q equipped with the Scratch Wireless service. This giveaway is open to residents of the US only who are 18 years or older. Ends 3.7.14. DISCLAIMER: All products received are complimentary for testing purposes from Scratch Wireless. All opinions stated are my own and are not influenced by any affiliates. That my phone will never get scratch! i'm always home (with wifi) so it'll be perfect! i can stop using my other one unless for emergencies, and i can stop paying 600/month for my phone! That I can use it all I want with WiFi without worrying about running up the bill! the cost is low. I have Sprint so I know the Sprint network is good. I had looked in to this but I use way too much data so this wasn't option for me. I like that the monthly costs are affordable. wifi wherever? sign me up! I would save so much, especially with my teens!! I hadn't heard of this before. I think this will be perfect when my older two get phones next summer. This is an awesome idea! Very useful for teenagers. Thanks for the tip! This Is Great And The Prices Are Cheap! I like the fact that I can use Wi-Fi wth the high bill. I hope that this is a money saver because i use Wi-Fi a LOT ! Awesome giveaway & great way to save money!!!! My cell phone bill is our biggest household bill. I am beginning my search to find a lower alternative. Thanks for sharing one possibility. I LOVE the idea of this for kids! My oldest is begging for a phone and this would be such a great solution. The free texting? Hello! That's awesome! I love that its actually affordable which is hard to find! I can use it at home and won't be charged.